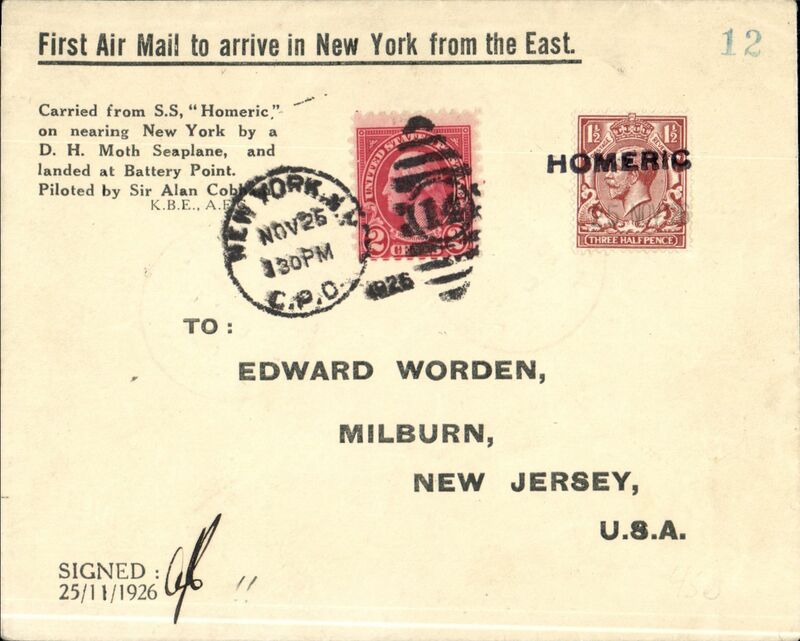 Sir Alan Cobham demonstration flight from SS Homeric at sea to Battery Point, New York City, flown and initialled by Sir Allan Cobham, printed souvenir cover bears cachet "First Air Mail to arrive in New York from the East". Illustrated p 1545 AAMC. Scarce item in fine condition. 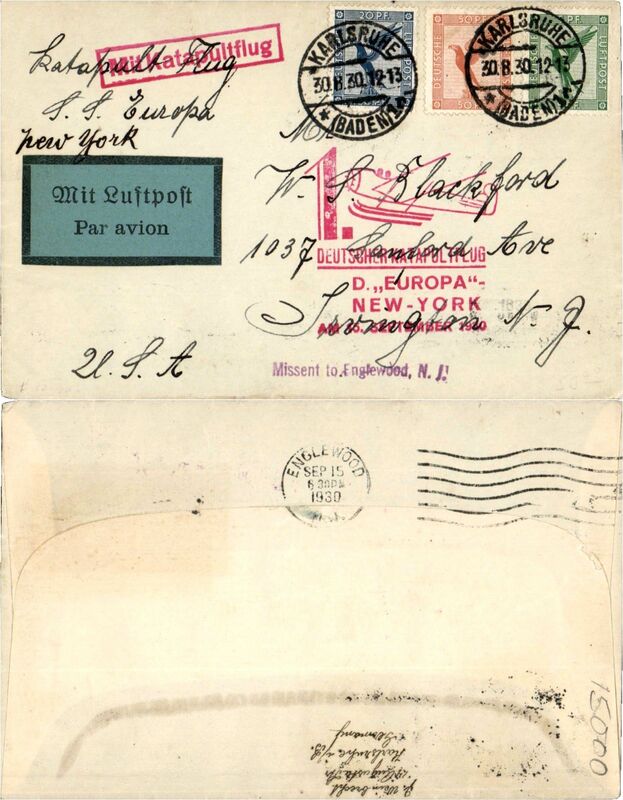 Schildauer's attempted ship to shore flight from Staten Island to SS Leviathan, Roessler Lindbergh 'Spirit of St Louis' cover, franked C10 and 2c, 12c canc NYGrand Central duplex, verso black "Air Mail Flight Failed To/SS Leviathan" cachet, bs Varick St Aug 22nd. 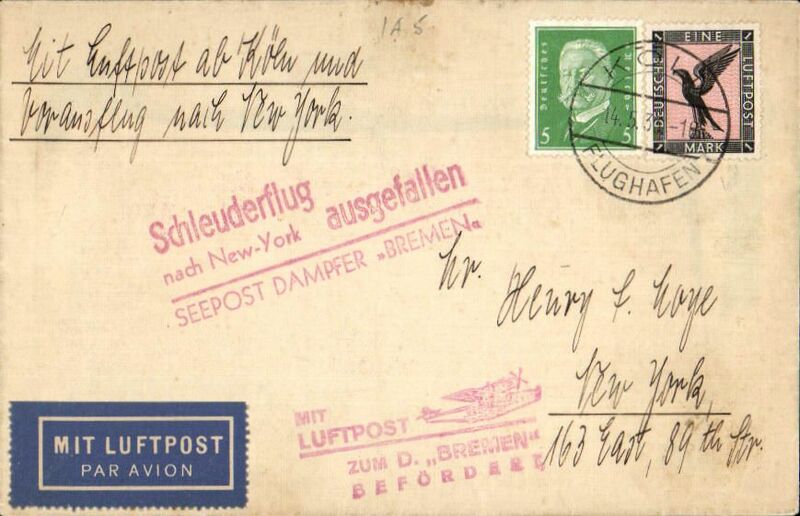 Schildauer's attempted ship to shore flight from Staten Island to SS Leviathan, franked 12c canc NY duplex, typed 'Via Air Mail/to SS Leviathan', verso black "Air Mail Flight Failed To/SS Leviathan" cachet. 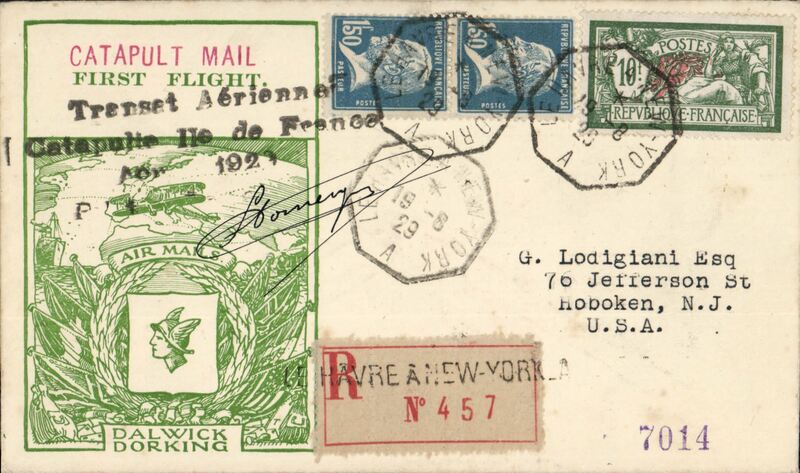 Isle de France catapult flight to New Jersey, bs Boston 3/9, Compagnie Generale Transatlantique cover franked 1920 10F Merson and 1 50c, canc octagonal Le Havre 3-9-28 date stamp, red/black tied 'Par Avion' etiquette, typed 'S/S Ile de France/By Hydroplane - Sip to Shore'. Slight fading of typed characters, see scan. 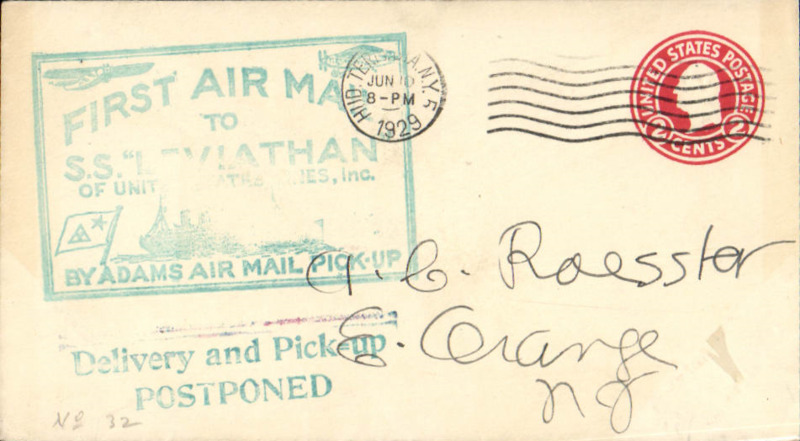 First attempt air mail pick up at sea from SS Leviathan by Adams Air Mail Pick Up, 5c US postal envelope, canc New York cds, large blue/green 'First Air Mail/To/SS Leviathan' cachet. This attempt was unsuccessful so a two line magenta cachet 'Delivery and Pick-up/Postponed' was applied on the front, AAMS #601. There is no toning on the back. What is showing on the scanis an artifact. 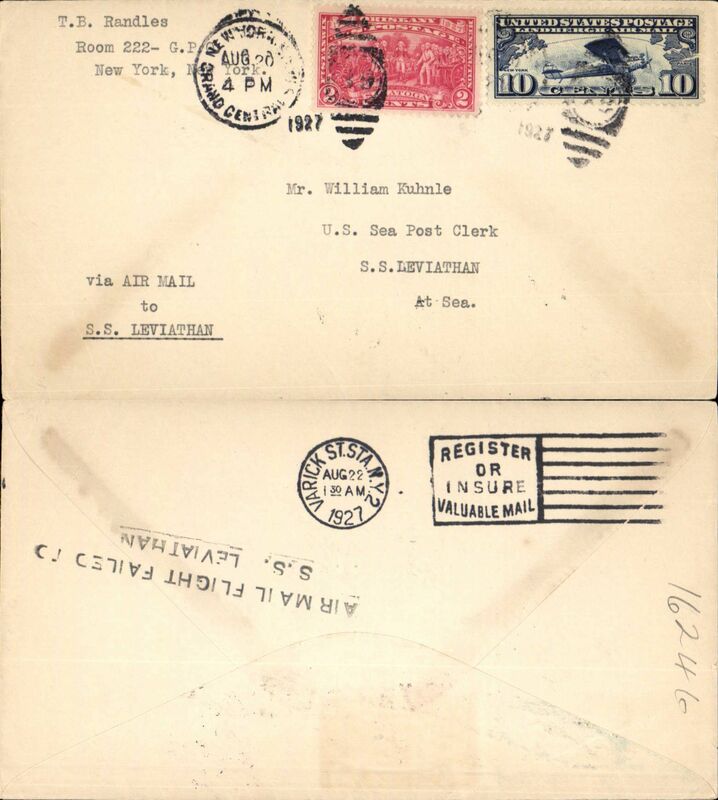 First East-West German North Atlantic Catapult Flight, Germany to New York, no arrival ds, red NDL and black oval flight cachets, plain cover franked Germany 10, 15, 50pf 1926 airs, canc Dusseldorf cds, black/yellow airmail etiquette, inland origin. 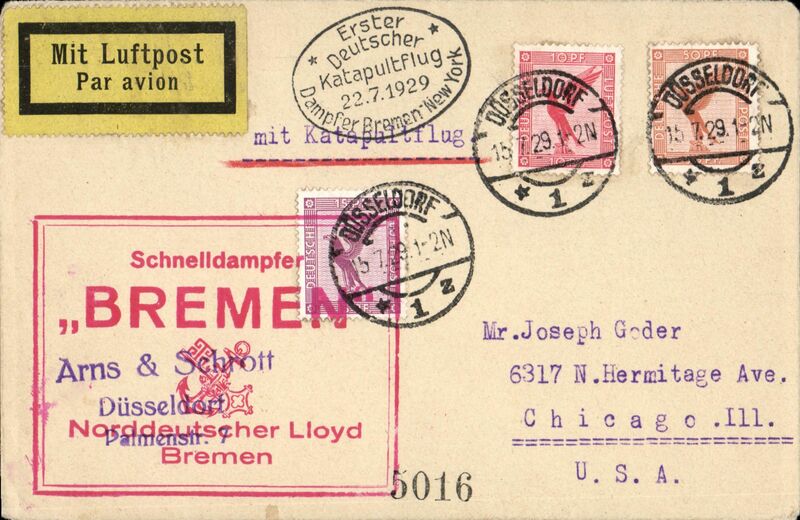 First German North Atlantic Catapult Flight, SS Bremen into New York, Norddeutscher Lloyd Bremen printed cover franked 75pfg canc Deutsch-Amerika Seapost on board Bremen twin circle hs, fine red “Schnelidampfer/ Bremen/ Norddeutscher Lloyd Bremen ” flight cachet. 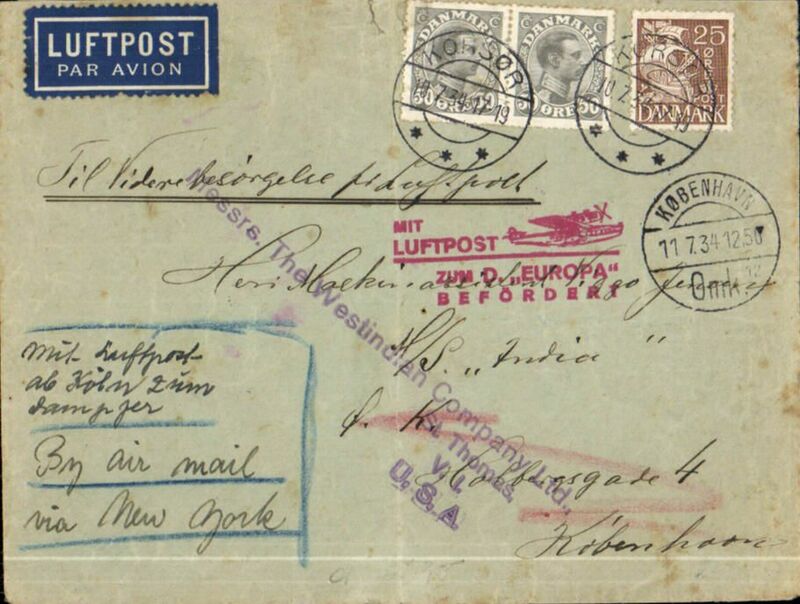 North Atlantic Catapult, Bremen-New York cover, landpost, franked 75pf canc Hannove/Flughafen cds's, oval black first flight/2.7.29, and large boxed red Bremen cachets. 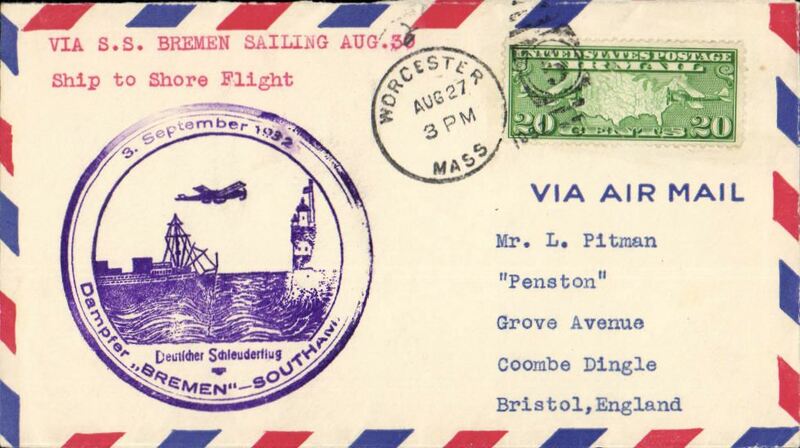 German North Atlantic Catapult Flight, New York to-England, no arrival ds, red framed Bremen 2.8.1929 flight cachet, plain cover franked USA 20c. 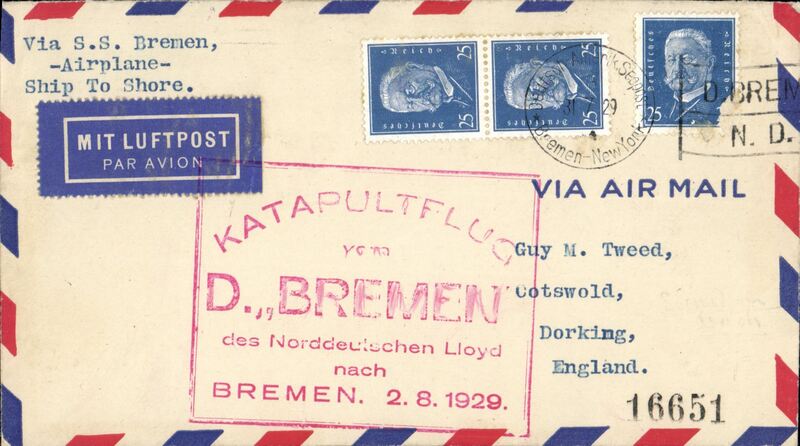 German North Atlantic Catapult Flight, Bremen-England, no arrival ds, red framed flight cachet, plain cover franked Germany 25pf x3 (one has a corner fault). Signed by the captain L. Ziegenbein. 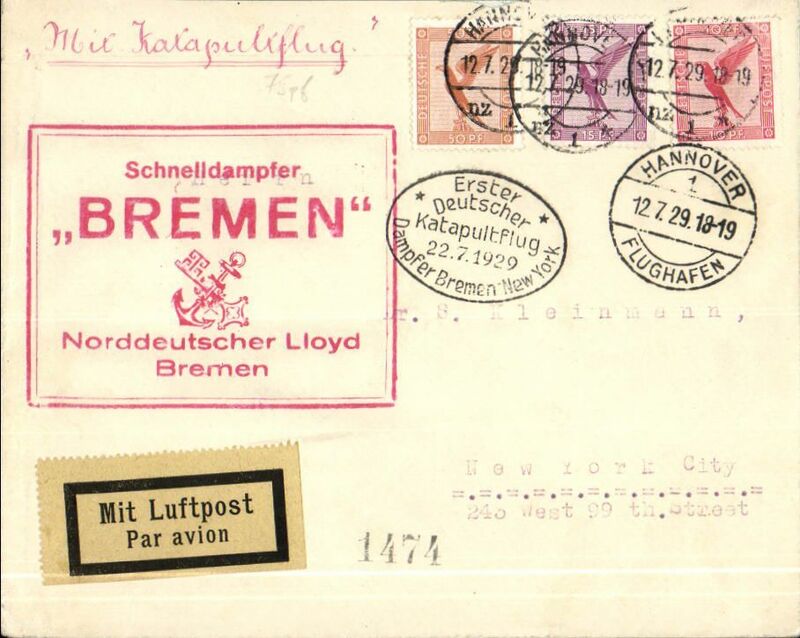 Cover flown from SS Bremen into Bremerhaven, franked 75pfg canc on board Bremen twin circle hs, fine red “Katapultflig vom D Bremen des Norddeutschen Lloyd nach Bremen 2/8/29” flight cachet and fine red framed 'Mit Katapultflug' hs. 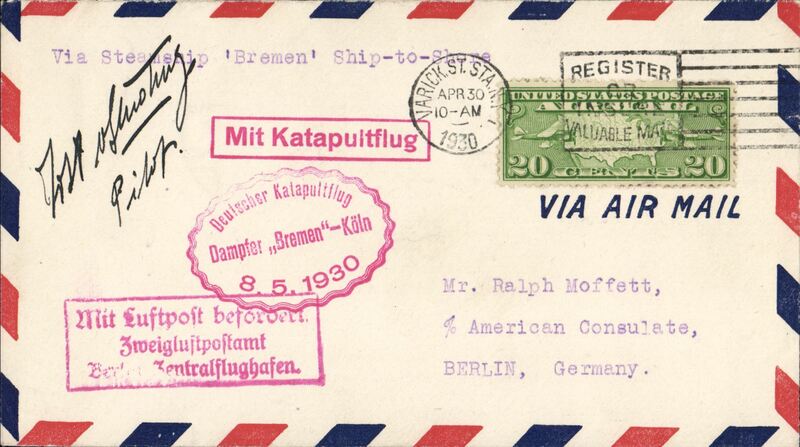 German North Atlantic Catapult Service to New York, inland origin via Koln-Cherbourg supplimentary flight, franked German 75pf canc Berlin cds, red flight cachet, red 'Luftpost befordert/Koln 2' hs, black/yellow airmail etiquette. London to New Jersey, USA, bs Foreign Section/ M.D.G.P.O. 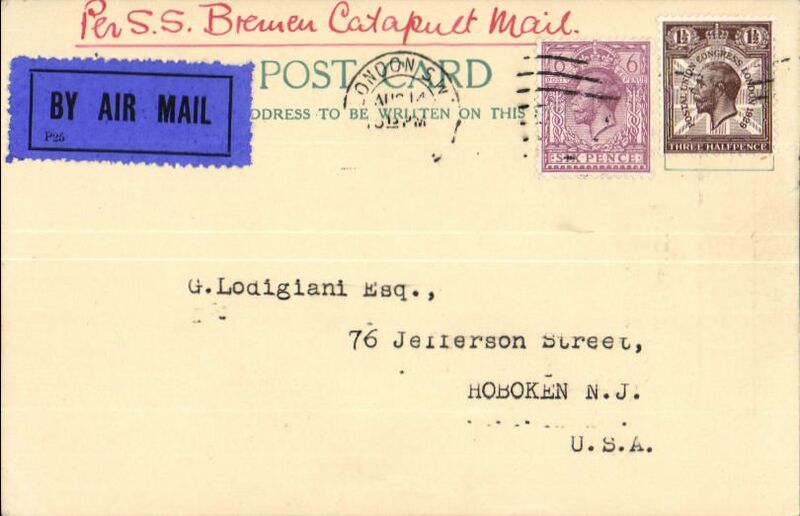 (Mail Division General Post Office, New York), Dalwick PC franked 7 1/2d, canc London S.W./Aug 14, ms "Per SS Bremen Catapult Mail", untied dark blue/black airmail etiquette. The year of posting is illegible, but there is an ms '1929' verso. 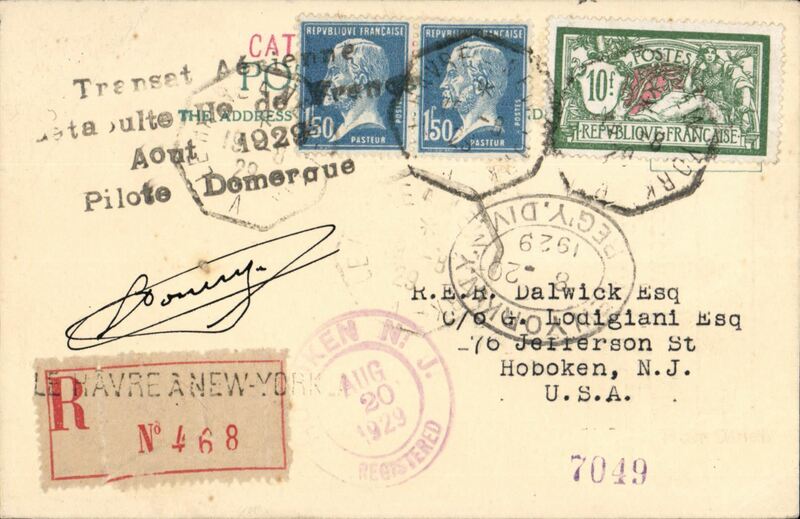 S.S. Isle de France, return first catapult flight piloted by Domergue, New York to Paris, bs Gare du Nord 27/8, Roessler 'Ship to Shore' printed souvenir cover, franked 26c, canc New York/Foreign oval ds. 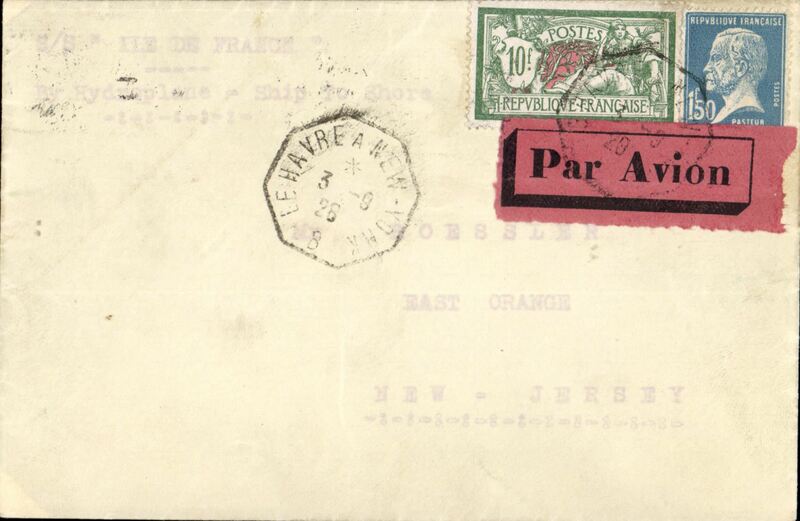 Ile de France, piloted by Domergue, Le Havre to New York, registered (label) cover franked 1920 10F Merson + 2x 1F50, on board hexagonal 'Le Havre to New York/19-8' cancellation, black four line "Transet Aeriene/Catapulte Ile de France/Aout 1929/Pillote Domergue". Only a few were struck with this cachet. Signed by the pilot Domergue. 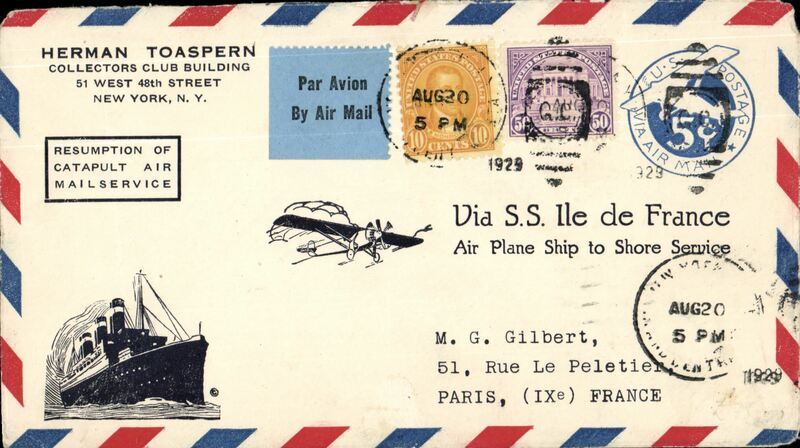 This US 5c PSE with additional 60c US stamps and corner B&W imprint of 'SS Ile de France' and monoplane in flight and framed 'Resumption of/Catapult Air/Mail Service' imprint , was carried on the third experimental flight of 1929, posted in New York on August 20th and flown from SS “Ile de France” to Paris, bs “Paris Gare du Nord/27.VIII.1929”. 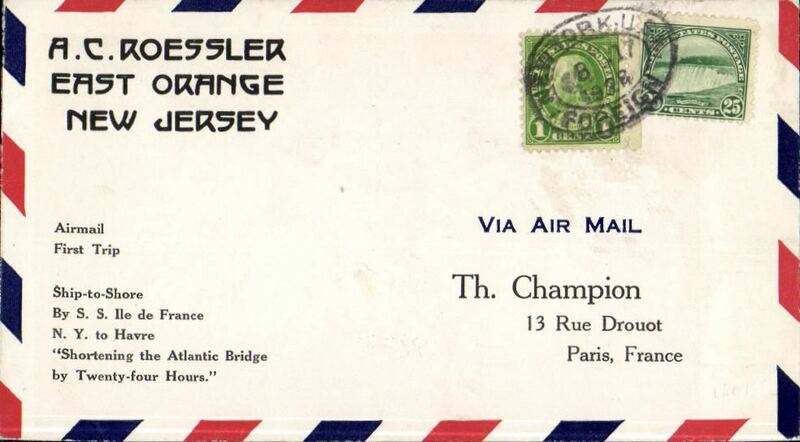 S/S Isle de France, return first catapult flight piloted by Domergue, New York to Paris, bs Gare du Nord 27/8, scarce orange-brown Roessler 'Ship to Shore' printed cachet envelope ROE-STS1, franked 65c, canc New York oval and Varick St machine ds's. 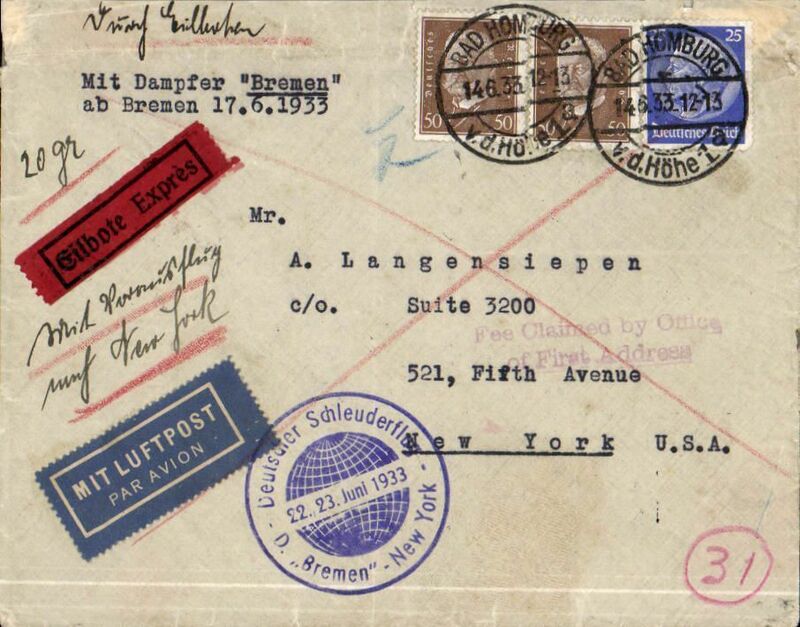 German North Atlantic Catapult Service to New York, franked 55pf German stamps canc Europa twin circle seapost handstamp and Machine 'Flag' cancel, official '29.4.1930' red flight cachet, original red boxed catapult route handstamp, blue/white airmail etiquette, Wenzel company cover. 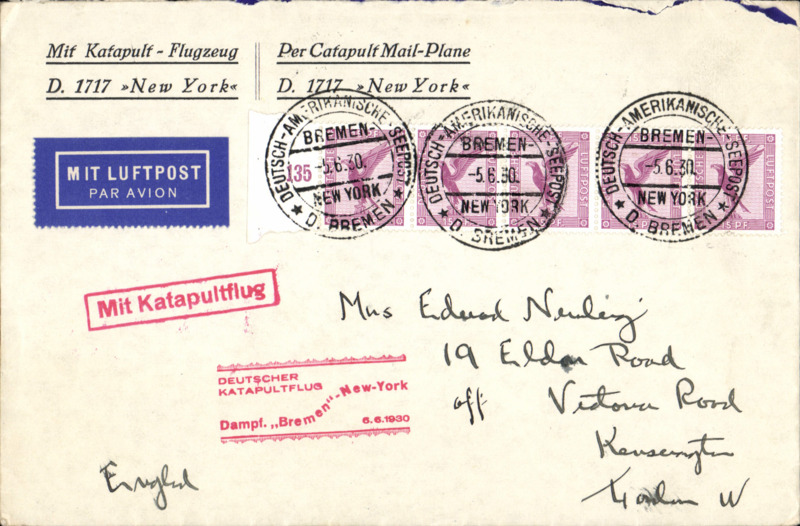 German North Atlantic Catapult Flight, New York to Europe, red framed 'Mit Luftpost befordert/Zweiglftpostaftampt/Berlin Zentralflughafen', circular Berlin 'Berlin C2/8.5.30' arrival cachet verso, plain cover franked US 20c air, canc Varick St/30/4/30, inland origin, red flight cachet, red framed 'Mit Katepultflug' advisory cachet. Signed by the captain Jobst von Strudnitz. A neat hand drawn map, 16x9cm, of route accompanies this item. 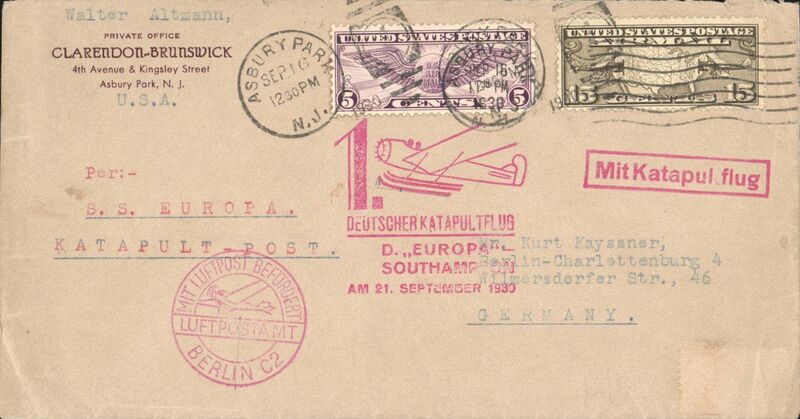 German North Atlantic Catapult Service to New York, franked German stamps canc Europa twin circle seapost handstamp, red flight cachet, original red boxed catapult route handstamp, blue/white airmail etiquette, NDL company cover with logo on flap. 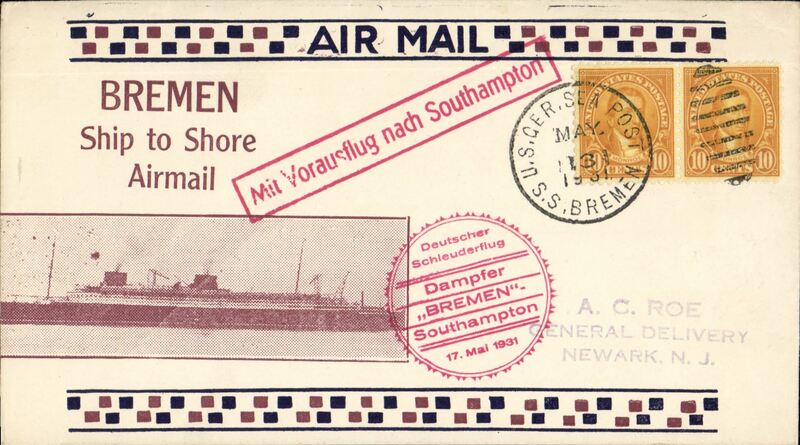 Airmail PPC flown from SS Bremen into Southampton, showing Hoboken S.S. Piers, Hoboken, New Jersy, franked US 18c canc New York May 20 1930, red circular “ Dampfer Bremen Koln/25.5.1930” flight cachet and red original boxed catapult hs and red" “Mit Luftpost/ befordert/Hamburg-Fuhlsbuttel/Flufplatz". 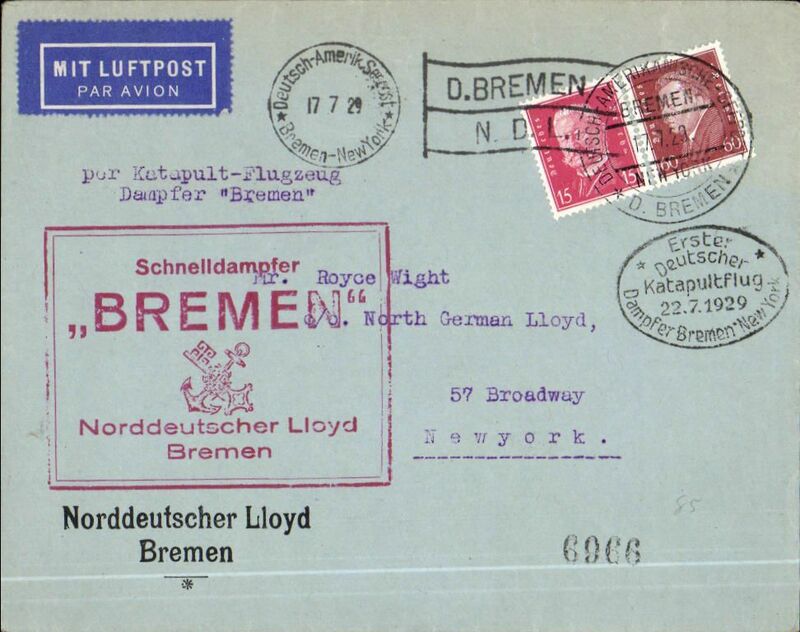 Bremen-New York, and on to London, bs 12/6 by sea, printed souvenir 'D1717-New York' corner cover with blue 'flag' logo on flap, franked 80pf, seapost cancel, red flight cachet, red framed 'Mit Katapultflug' hs. 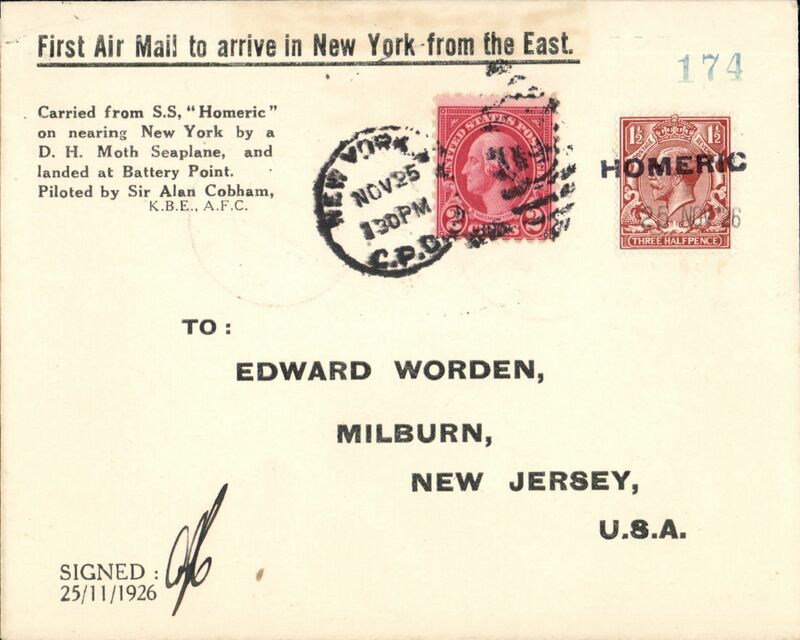 Bremen-New York, printed souvenir 'D1717-New York' corner cover with blue 'flag' logo on flap, franked 80pf, seapost cancel, red flight cachet, red framed 'Mit Katapultflug' hs. 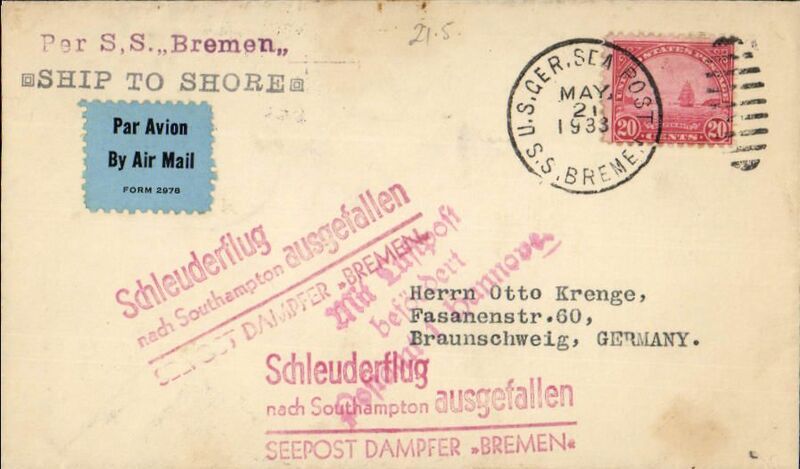 German North Atlantic Catapult Flight, Bremen-Southampton, no arrival ds, souvenir airmail cover with large green imprinted 'Bremen' cachet franked 17c,canc U S Seapost. 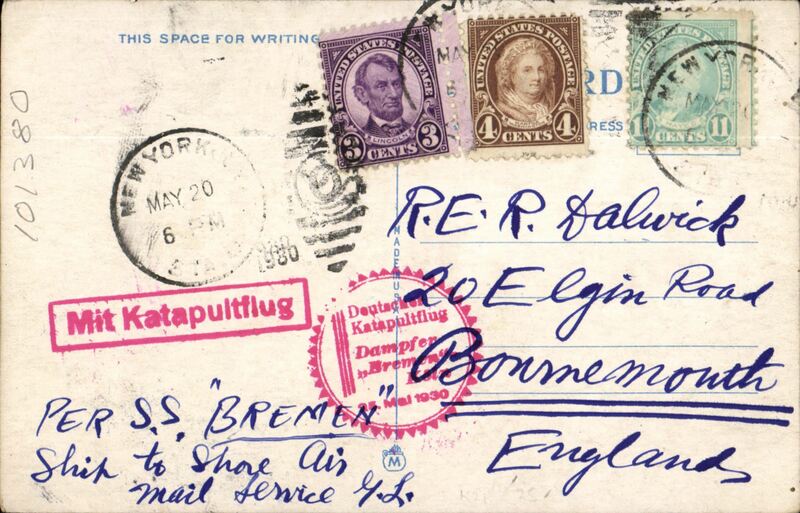 First acceptance of mail for Peru from Germany, for carriage on the first supplementary flight to 'Columbus', Berlin to Lima, bs 11/8, plain cover franked 2M 195pf, canc Berlin cds, posted late in Berlin, then accelerated via the Koln-Cherbourg feeder service, to catch SS Bremen at its last port of call prior to departure on its trans-Atlantic voyage to New York. 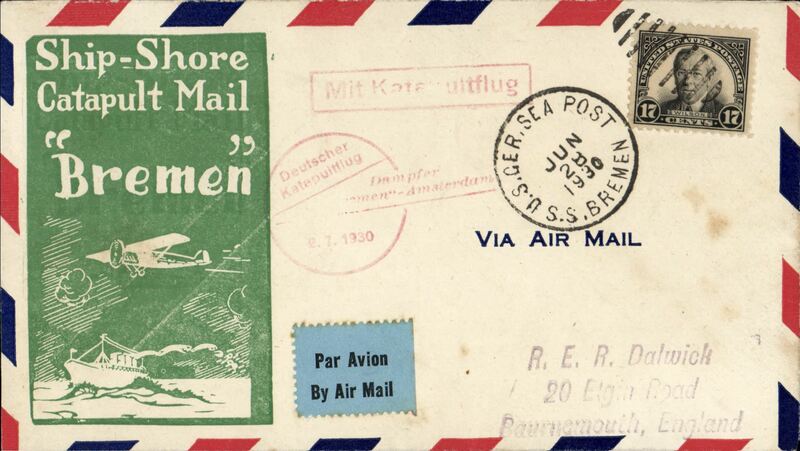 The cover has an official red 'Mit Luftpost/zum Dampfer/Columbus/Befordert' feeder flight cachet and a dark blue/white etiquette. A most interesting supplementary flight item. 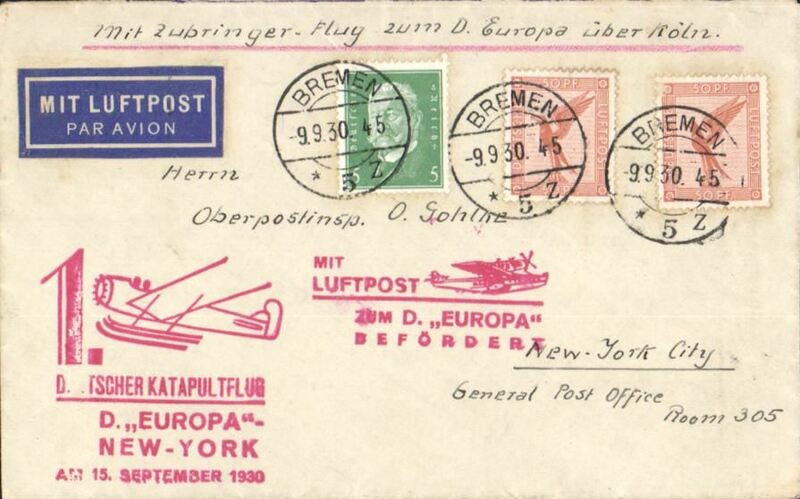 First westbound catapult airmail flight from 'Europa', and also carried on a Koln-Cherbourg supplimentary flight, Bremen to New York, airmail etiquette cover franked 105pf, red supplementary and red Europa flight cachets, ms "Mit Zubringer Flig zum D. Europa uber Koln". Graue and Leter K47c. 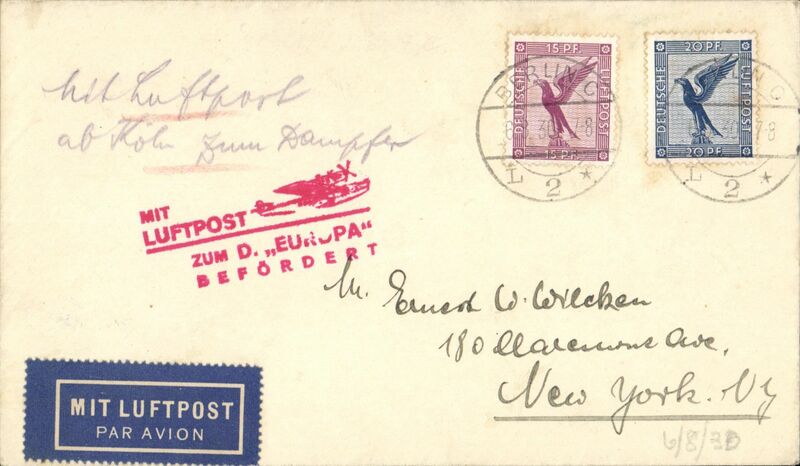 Cover to New York, private 'Sep 19 1930' reception hs verso, German seapost, franked 1M canc Europa twin circle ds, red “Deutscher Katapultflug/ D, Europa/New York am 15. 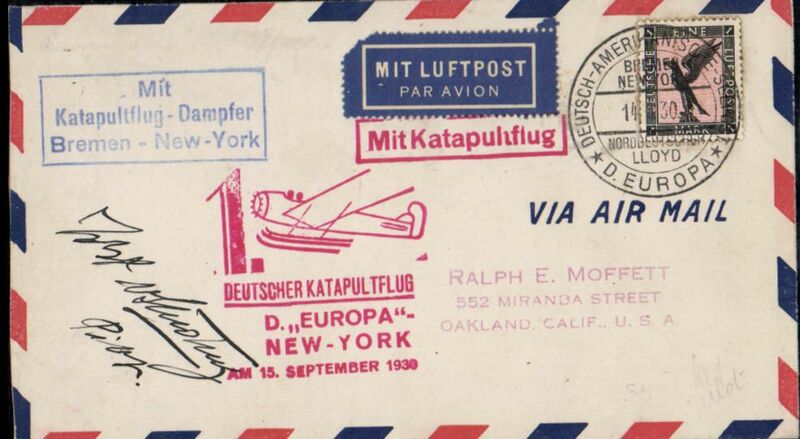 September 1930" flight cachet, red “Mit Katapultflug" hs, boxed blue "Mit/Katapultflug-Damfer/Bremen-New York". Signed by the pilot, Capt. Jobst von Studnitz. 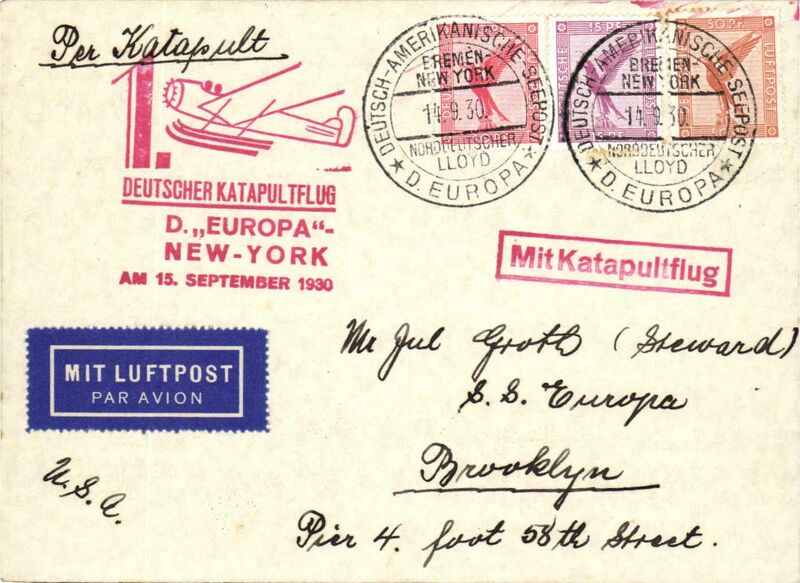 German N. Atlantic Catapult, first westbound from Europa, cover to New York, b/s, franked 75pf canc Karlsruhe cds, red “Deutscher Katapultflug/ D, Europa/New York am 15. September 1930" flight cachet, red “Mit Katapultflug" hs, black/green blue etiquette. 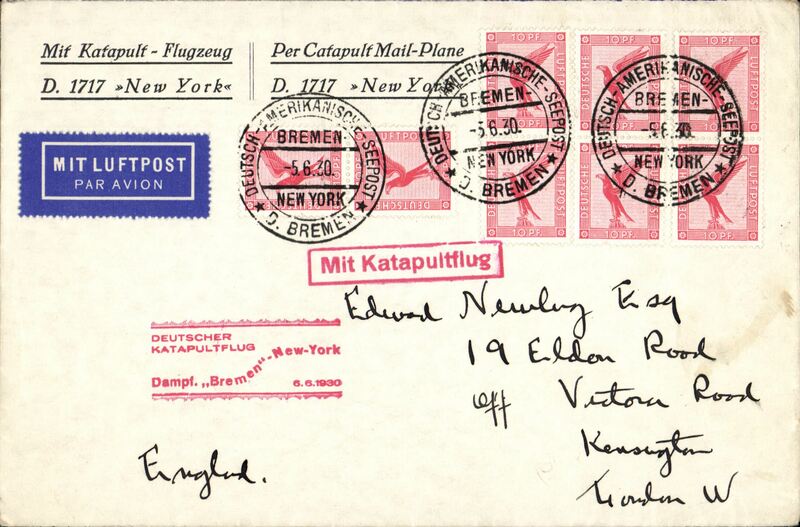 German N. Atlantic Catapult, first eastbound from Europa, cover to France, black Neuilly cds receiver, franked 20c air, canc New York, red Deutscher Ktapultflug/ D, Europa/Southampton AM 21. 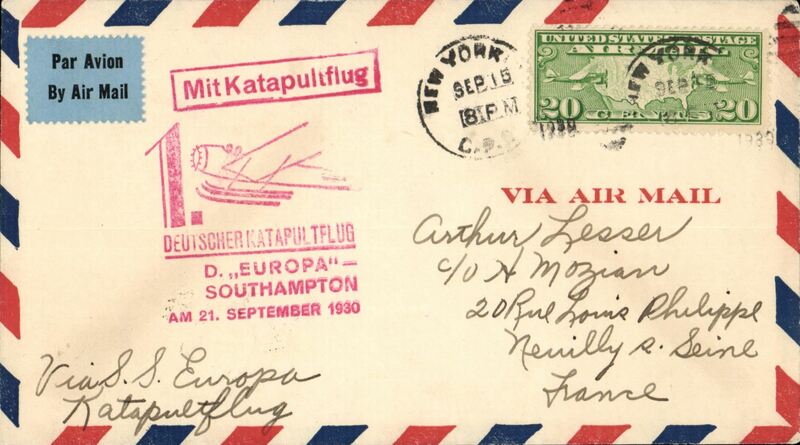 September 1930" flight cachet, red “Mit Katapultflug" hs, black/green blue etiquette. 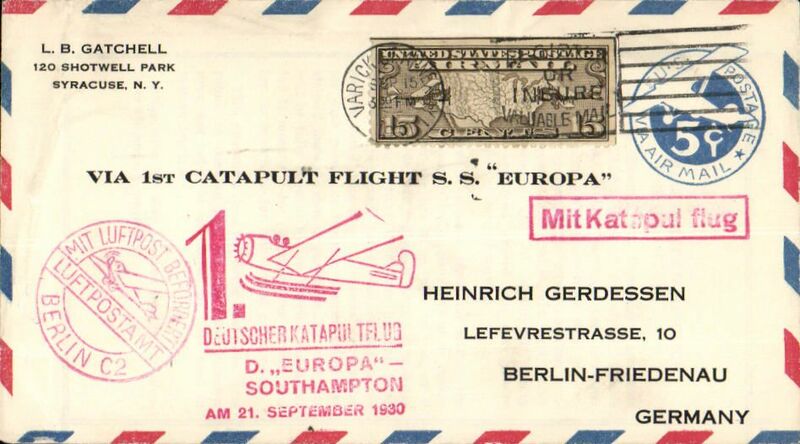 German N. Atlantic Catapult, first eastbound from Europa, cover to Berlin, red circular Berlin C2 Luftpost receiver, 5c US PSE withADDITIONAL 15c air, canc Varick St cds, red “Deutscher Katapultflug/ D, Europa/Southampton AM 21. September 1930" flight cachet, red “Mit Katapultflug" hs, black/green blue etiquette. 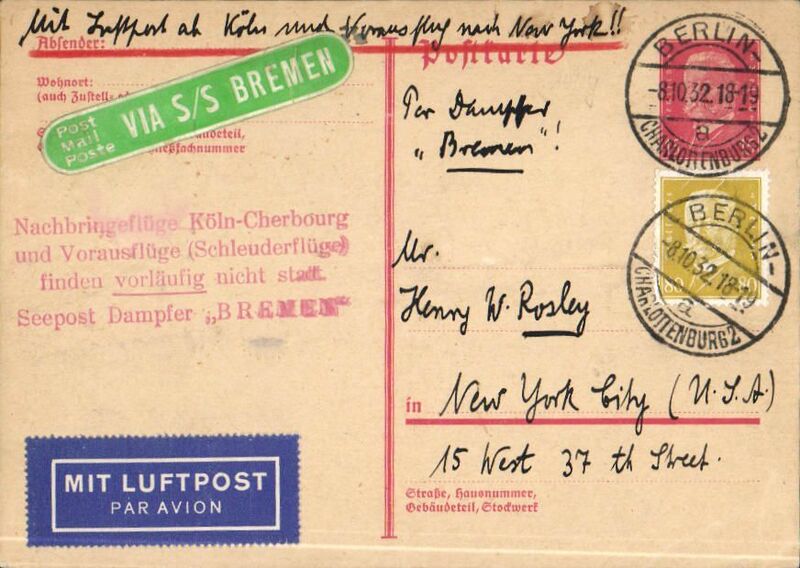 German North Atlantic Catapult Flight, New York to Europe, red circular Berlin 'Mit Luftpost Berlin C2' arrival cachet on front, plain cover franked US 5c,15c airs, canc Assbury/Sep16 , inland origin, red flight cachet, red framed 'Mit Katepultflug' advisory cachet. 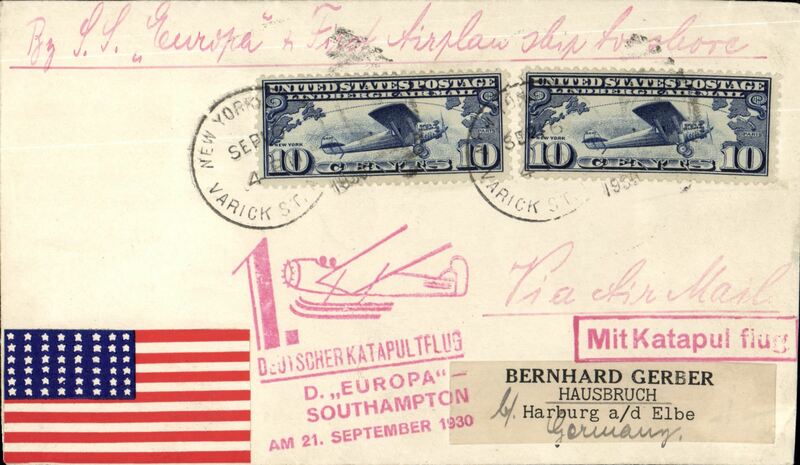 First eastbound catapult flight from Europa, cover franked 2x10c US airs, canc New York Sep 16, 1930, red “ Deutscher Katapultflug/D Europa/Southampton/21 September 1930” flight cachet, red original boxed catapult hs. The flight was one day late due to adverse weather conditions, flew to Amsterdam. 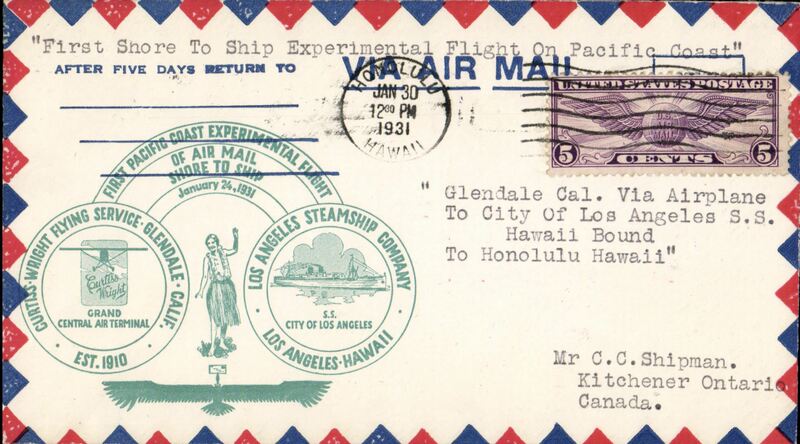 F/F Pacific Coast Experimental shore to ship flight from S.S." City of Los Angeles", LA Steamship Company to Hawaii, special cachet, magenta" SS City of Los Angeles Reception" h/s, and Honolulu arrival cds. Image. 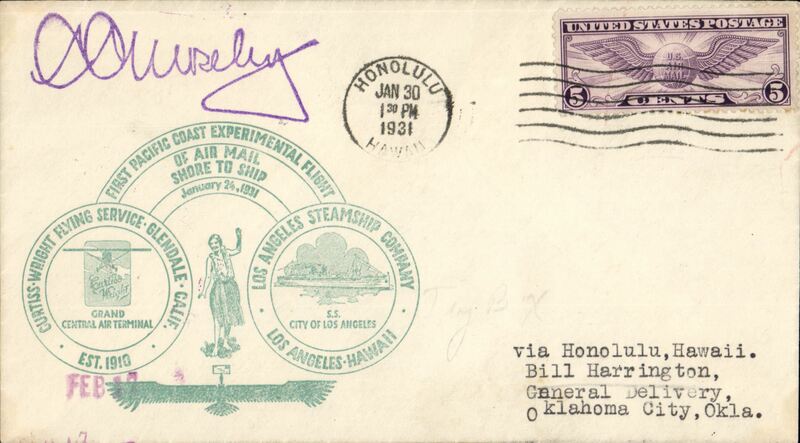 F/F Pacific Coast Experimental ship to shore flight from S.S." City of Los Angeles", LA Steamship Company to Hawaii, green souvenir flight cachet, violet double circle "Earle Ovington- First US Air Mail Pilot" cachet verso, magenta" received/jan, 24, 1931/SS City of Los Angeles" reception" h/s, Honolulu arrival duplex, bears three signatures - one facsimile. 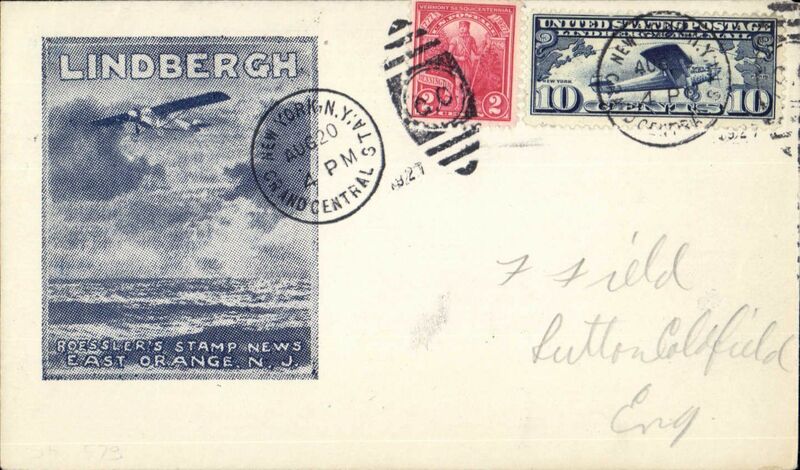 German N. Atlantic Catapult, westbound cover flown from SS Bremen into New York, bs 27/5, attractive cream/brown-black borders Roessler cover franked US 20c, canc 'US Ger .Sea Post/SS Bremen', fine strike circular red flight cachet, and first use of directional cachet 'Mit Vorausflug nach Southampton'. Image. 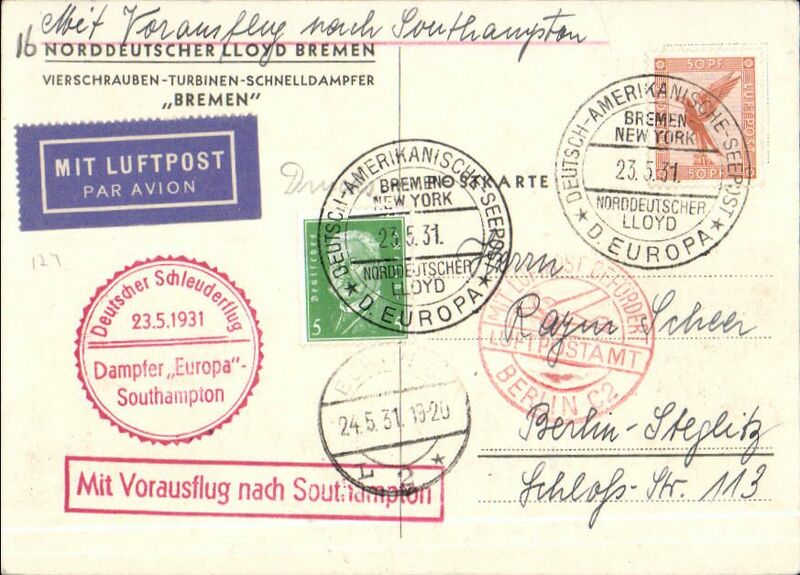 German N. Atlantic Catapult, eastbound from Europa to Berlin via Southampton, red circular Berlin C2 Luftpost receiver, black 24/5 Berlin C2 arrival ds on front, beautiful Norddeutscher Lloyd Bremen colour PPC of Bremen, franked 55pf, canc fine strike Deutsche Amerikanische Seepost/D Europa/23.5.31, red “Deutscher Schleuderflug/ D, Europa/Southampton /23.5.1931" flight cachet, red framed “Mit Vorausflug nach Southampton" hs, black/green blue etiquette. Lovely item. 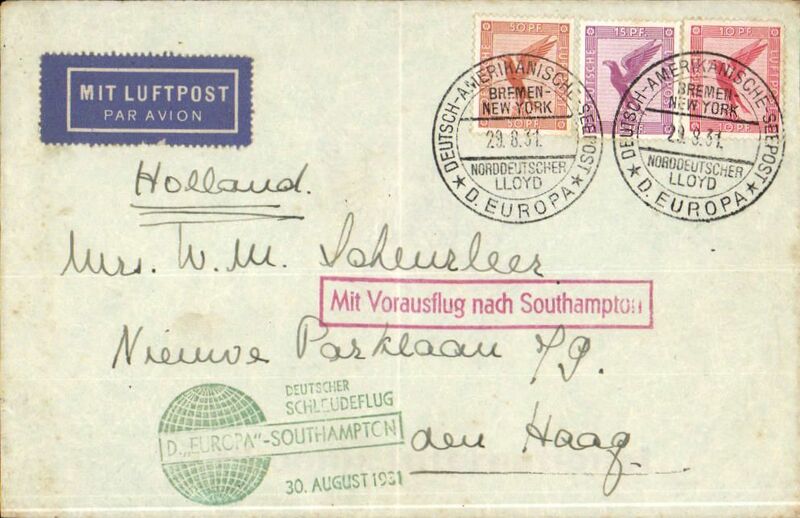 German N. Atlantic Catapult, eastbound from Europa to Bremerhaven via Southampton, company cover with NDL logo on flap franked 75pf, canc fine strike Deutsche Amerikanische Seepost/D Europa/28.8.31, green “Deutscher Schleuderflug/ D, Europa/Southampton /30.8.1931" flight cachet, red framed “Mit Vorausflug nach Southampton" hs. The green Europa cachet has the missing "R" of "Schleuderflug" - the only know error of this cachet. Ironed vertical crease. 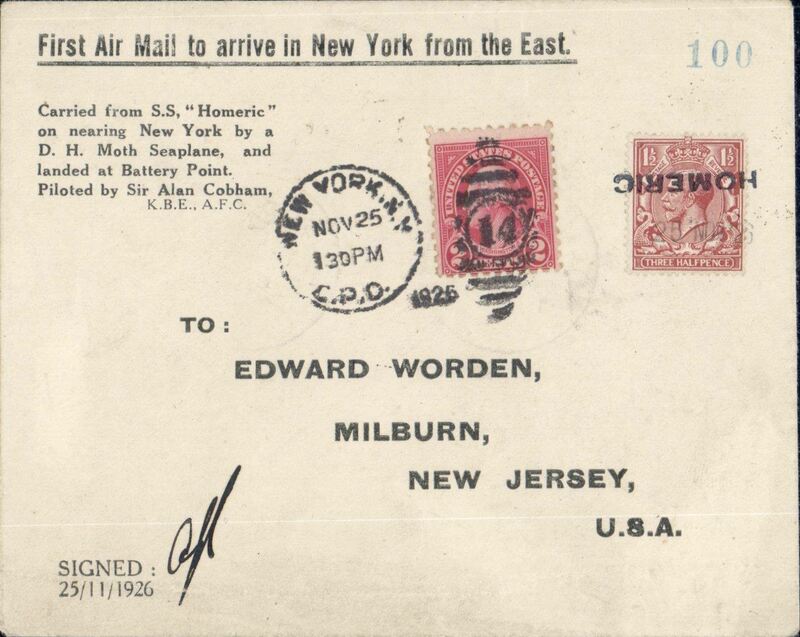 German North Atlantic Catapult Service New York to England, no arrival ds, airmail cover, franked 20c US stamps, fine strikeviolet Bremen twin circle cachet..
Post Season mail for North Atlantic Catapult, Bremen-New York, 15pf PC with additional 80pf canc Berlin/Charlottenburg cds, red "Nachbringefluge Koln-Cherbourg............" cachet (Flown to Cherbourg, but no flight after the season's cose), white/gree 'Via S/S Bremen' vignette, airmaikl etiquette. Graue and Leder K135a2. 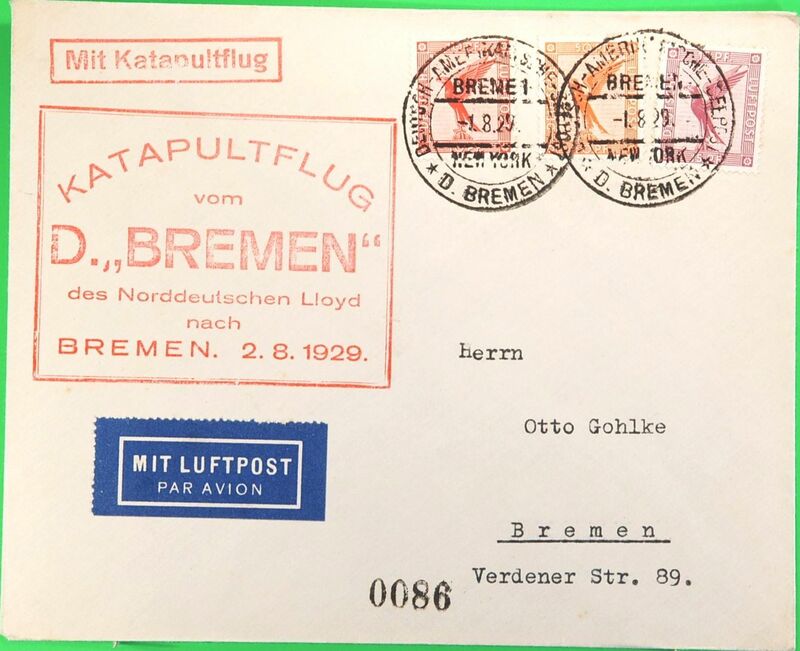 First 1933 western sailing of SS Bremen, airmail etiquette cover franked 1M5pf, flown by feeder flight to Cologne and canc Koln Flughafen on 14th May, red pictorial "Mit Luftpost Zum D'Bremen Befordert" Koln-Cherbourg supplementary cachet. 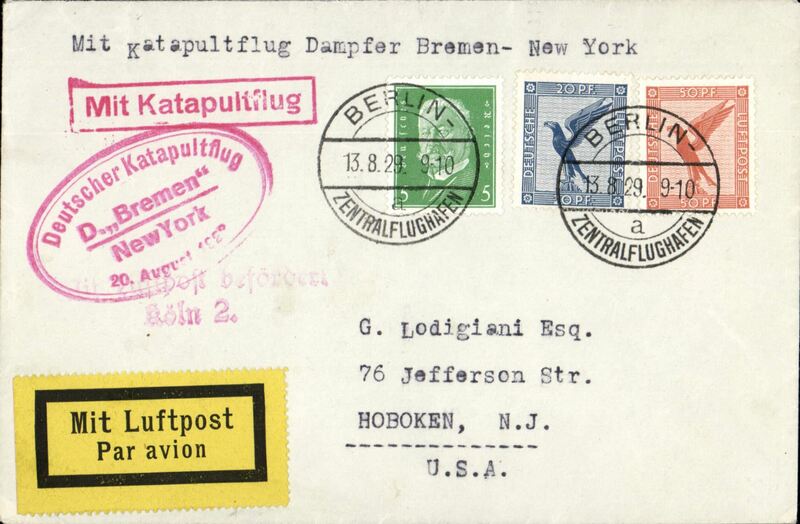 The flight was cancelled due to engine trouble so the cover also bears the red "Schleuderflug/nach New York Ausgefallen/Seepost Dampfer Bremen" cancellation cachet. Scarce with the supplementary and cancellation cachets. 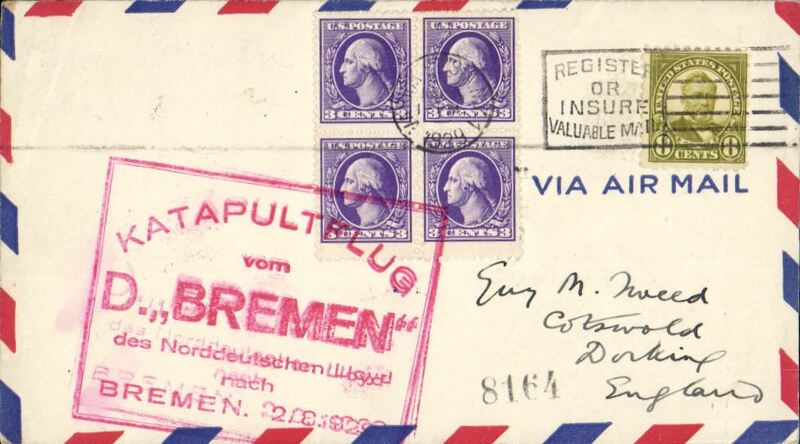 First 1933 Eastern sailing of SS Bremen, airmail etiquette cover franked 20c, canc US Seapost cds, addressed to Braunschwieg, bs27/5. 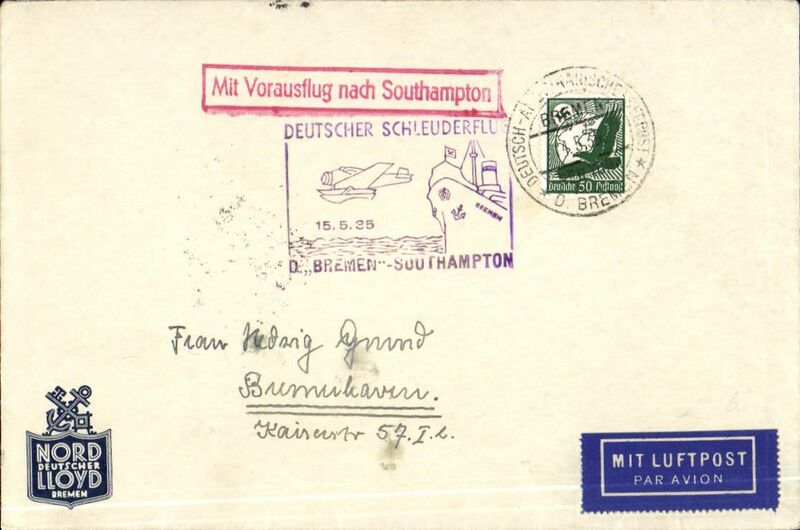 The catapult flight was cancelled due to engine trouble so the cover bears the red "Schleuderflug/nach Southampton Ausgefallen/Seepost Dampfer Bremen" cancellation cachet, flown from Bremen to Hannover, red ' Mit Luftpost/befordert/Hannover' arrival mark. 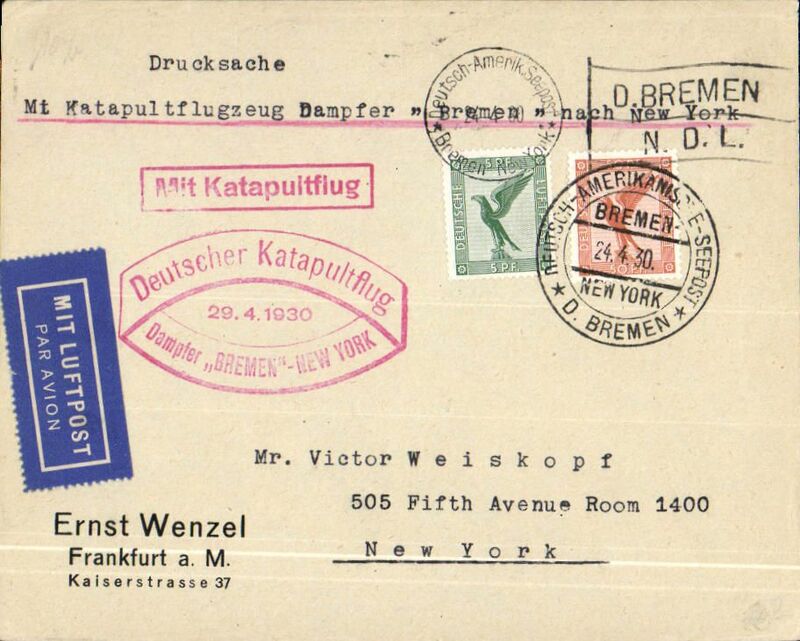 German N. Atlantic Catapult, westbound cover flown from SS Bremen into New York, bs 23/6, franked 125pf canc Bad Homberg cds, blue “Deutscher Schleuderflug/D.Bremen-New York/22/23.Jun.1933” flight cachet, red/black Express label, ms '20gr', white/dark blue etiquette. 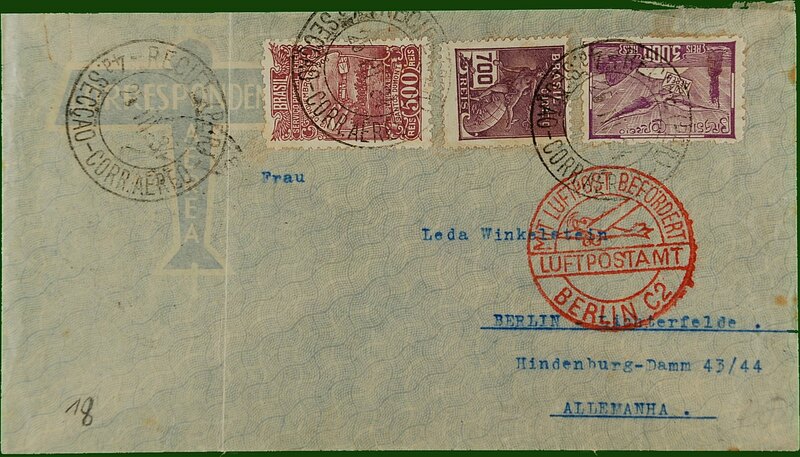 Air-Sea-Air cover to Berlin, bs 3/4, franked 4200r canc Recife cds, red circular Berlin C2 receiver on front. Flight dates suggest air by CGA to Natal, then "Aviso" to Dakar, then air AF/DLH to Berlin. 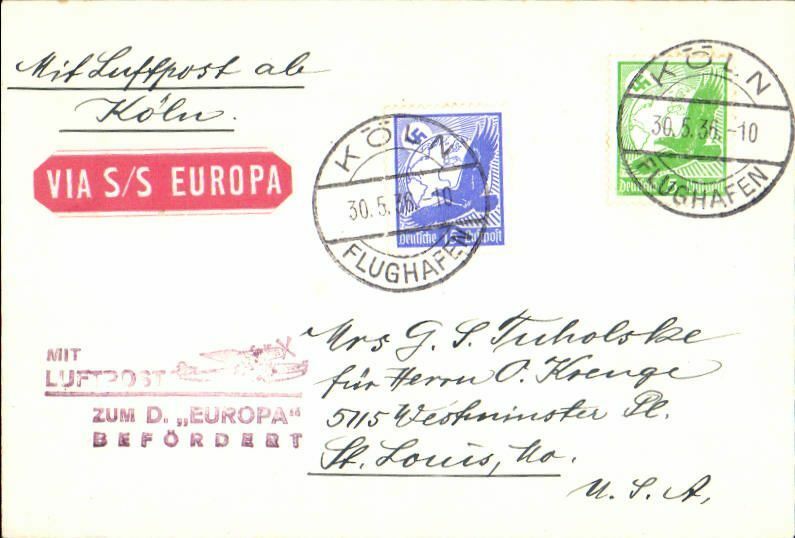 Denmark acceptance for the Virgin Islands, bs St. Thomas 29/8, for carriage on the 22/7/34 German North Atlantic Catapult Service Europa to New York, via Cologne, Koln/12.7.34/Flughafen transit cds verso, airmail etiquette cover franked 125 ore, canc Kobenhavn/ 11.7.34, red "Mit Luftpost/zum D. 'Europa'/Befordert" flight cachet, ms 'By Air Mail/Via New York', ref K193DK, Graue&Lieder. RARE to and from acceptances. Only c12 from Denmark and therefore, almost certainly, the only one for the Virgin Islands. 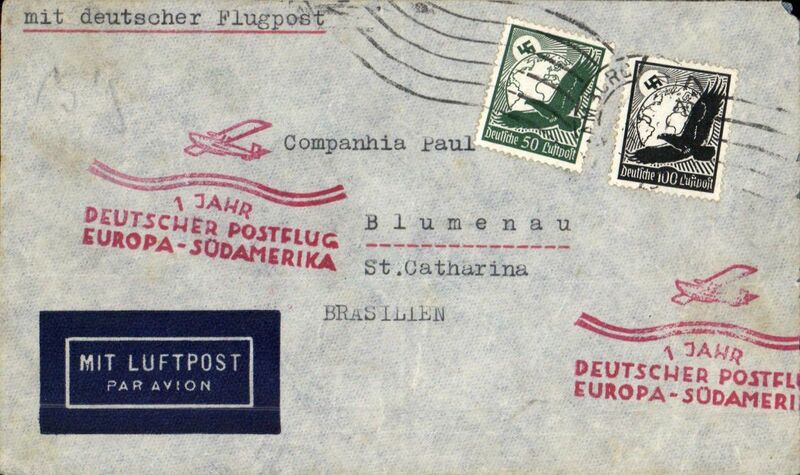 DLH, 1st anniversary South Atlantic service, airmail cover Hamburg to Rio de Janero, bs 7/2, franked 50pfg + 100pfg, special red cachet, typed 'mit deutscher flugpost', black 'Brasil-Europa/Servicio Aereo Transoceonico/Condor Zeppelin Lufthansa' cachet verso. 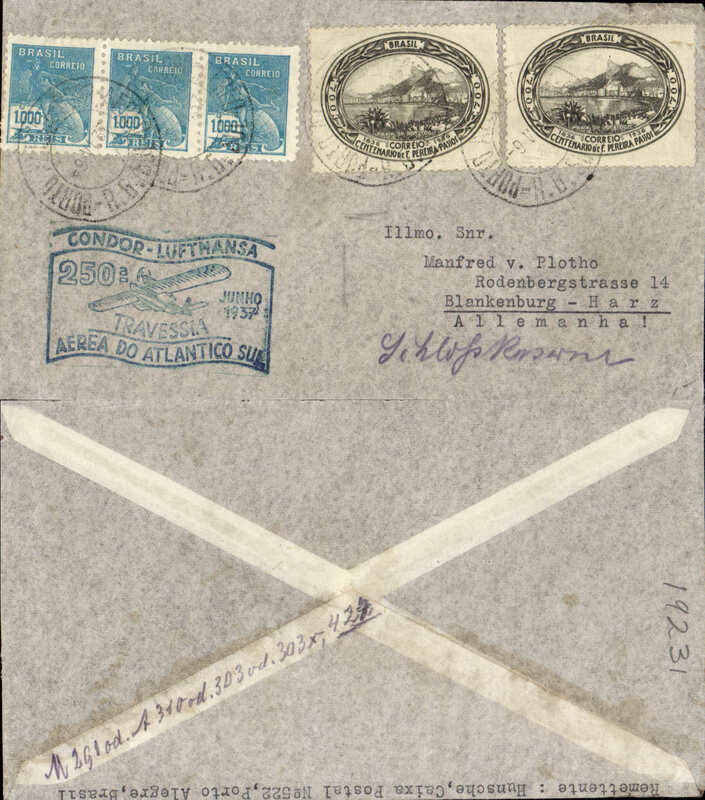 Spanish acceptance for carriage by German North Atlantic catapult, Barcelona to Brazil, bs 11/6, franked Spanish 4Px2 and 80c, uncommon black/red/grey imprinted "Por Avion Aleman Via Sevilla" blue/black/grey envelope with momoplane and Zeppelin against rays of sun in bottom lh corner, frame omitted with blue printed labels, see Frost E2b (cover alone catalogued $80 on catapult flight). 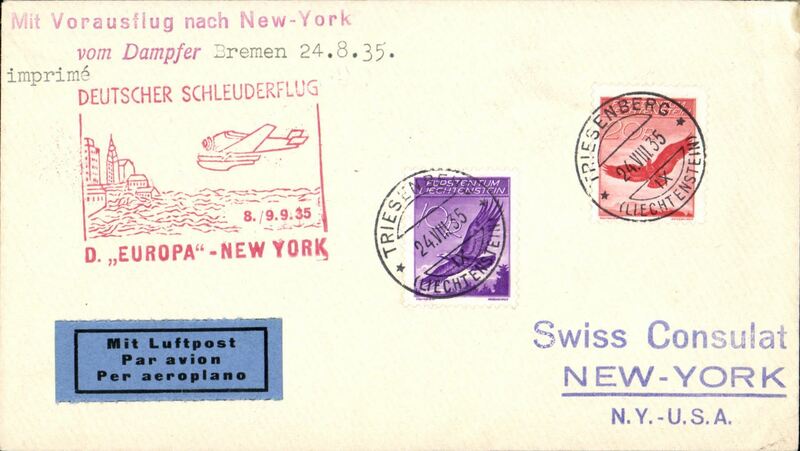 German North Atlantic Catapult Flight, Liechtenstein acceptance for the Europa to New York service, plain cover franked 1933 Liechtenstein Golden Eagle 10 and 20c, canc Triesenberg 24.VIII.35, red 'Deutscher Schleuderflug/8.9.35/D Europa-New York' flight confirmation cachet. Typed 'vom Damfer Bremen 24.8.35 - missed this flight and carried on the next W-E service. Only 19 flown, cat 1000USD, Graue and Leder. Rare item in fine condition. 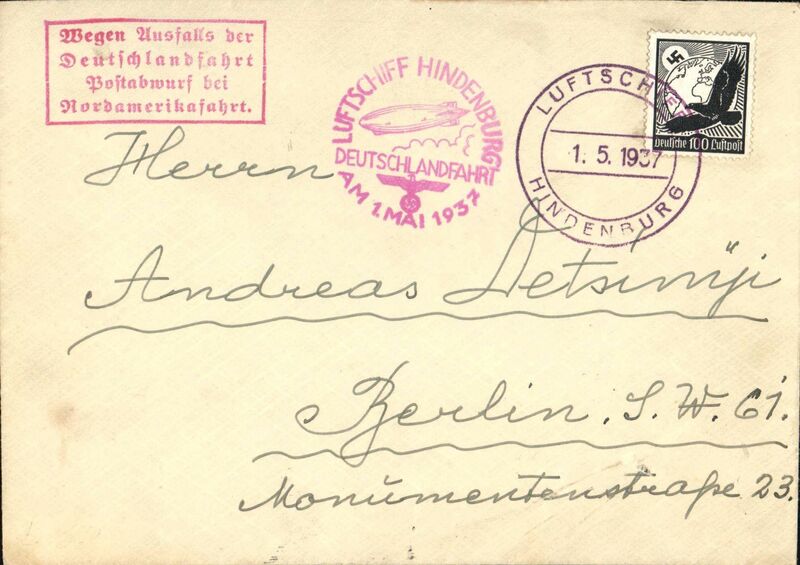 Hindenburg, cancelled Germany flight, plain cover franked 100pf, on board postmark, magenta flight confirmation cachet, red framed flight cancellation hs, Cologne drop. 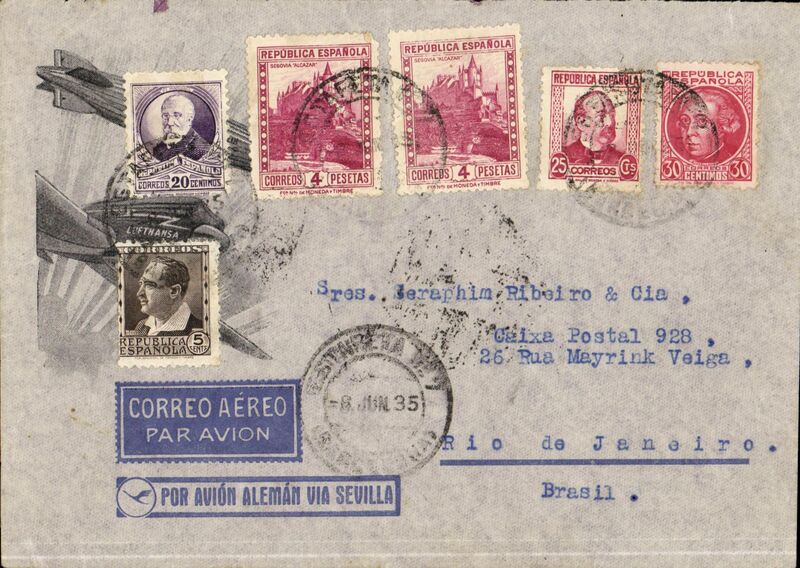 250th South Atlantic crossing, Condor/Lufthansa, Porto Alegre to Berlin, no arrival ds, flown across the South Atlantic to Europe, green 'flag' flight cachet, airmail cover franked 400R postage + 4000R airmail.